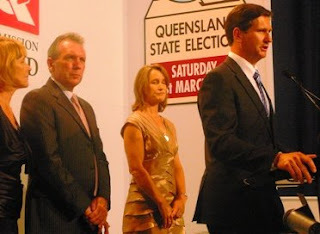 Saturday was the official start of my holidays, but having spent the 2006 state election night somewhere between St Petersburg and Tallin, I wasn't missing this - Queensland Decides 2009. Six o'clock saw the libidinous Disco Stu and I being comprehensively searched by over-enthusiastic security personnel outside Exhibition Hall 2 at the Convention Centre - The Tally Room (I seriously think that dude had a crush on you Stu. He was all hands). We entered to find a lack of space in our radio station's broadcast zone. No matter, we soon found a saviour in Sue from the Gold Coast Bulletin, who kindly let us crash her two extra seats for the evening. We set up the laptop, and started mingling. Line of the night happened early on, when Deputy LNP leader Mark McArdle arrived, only to be swarmed by journos and cameramen. A sassy young brunette in a CFM suit had been wandering around with a remote headphone-and-mic set-up, obviously doing live-crosses to whichever radio station she belonged to. They mustn't have cut to her in time, because I heard her exclaim loudly "Guys, I was trying to get you Mark McArdle, but I got caught in the media scum!" Turns out Sassy Brunette belonged to Switch FM, a local community station that broadcast out of the Metro Arts Building in the city. You would not believe the kit they had there - a bank of laptops, mixers, panels, microphones, and TEN (count 'em) young wannabe Kerry O'Briens there doing the broadcasting. 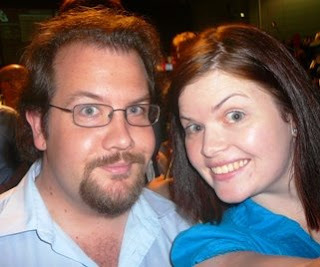 Turns out they'd conscripted some journalism students (mostly hot babes) to help with the coverage. I know this because when they were doing their thank yous at the end of the evening, one keen young buck made particular mention of it. "By the next state election, you'll probably be on a mainstream station, or even a TV station!". I leaned over conspiratorially to Stu: "Dude, you're not going to pick up here. Stop trying to win on, on-air!" Back to the count. We filed a few stories before word started filtering through that it was going to be Labor's night. At 8:30pm, Lawrence Springborg, who'd been watching proceedings from a private backroom, emerged onto the podium to concede defeat. He was accompanied by his wife, and deputy McArdle, whose face was redder than the suit Anna Bligh would later turn up in. "Soon they will feel the power of the fully-operational Death Star..."
Around 8:50pm, Bligh herself arrived through the main door, and was briefly subsumed by a swirling mob of media, suits and fans. She then took the stand herself, and looked genuinely ecstatic. 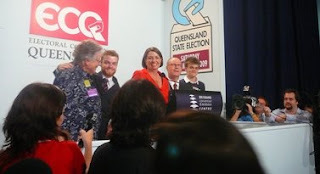 "Queenslanders - thank you!" she exclaimed, to great applause. "You can count on me... to wear fabulous shoes!" 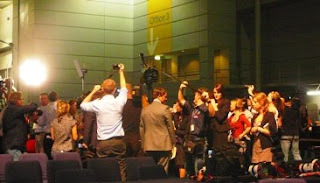 After her speech, Bligh was snatched by various TV crews, eager to do live crosses. Disco Stu and I went back to cutting audio and filing. Our laptop was not the fastest of beasts, meaning the entire ABC radio workforce (literally The Red Army - oh, they looked so efficient) had gone by the time we'd finished, leaving just a few tech blokes behind to pack up. But the good news? 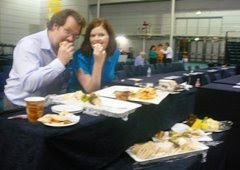 They'd left behind the ABC buffet! "We pay our eight cents a day, damnit!" The cheese was especially good. We scrambled out of there just before 11pm. All in all - a top night. I like that you managed to snap me casually holding the mic out on the other side of the podium from Bligh. I thought I was being quite clever avoiding the media scrum until I looked over and saw all the TV station's cutaway seconday cameras pointed straight at me. And I'd been doing so well not to make it into shot at that point. Also who does the ABC's catering? It was delicious. Hooray for Taxpayer Cheese. Did you save eight cents worth for me? Where's the pic of the sassy brunette (besides you of course GC)? Actually, now that most of the figures are in, it seems the result was very close. Only around 3000 votes needed to go to the LNP rather than labor across a couple of Key seats and the LNP would have taken government. It was just because it all happened to go Labor's way that they won several seats in quick succession, and it was all over. But those decisions were all very close. So actually most of the commentary was spot on, it just happened to come down on labor's side of the fence. Stop defending the media Stu. We know who signs your cheaques... probably large novelty ones at that!